This may be the year of the Japanese Role Playing Games (RPGs) for Nintendo 3DS, but Nintendo has managed to squeeze in a platformer as well. 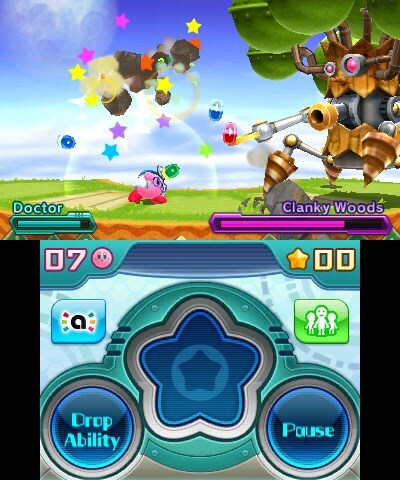 Kirby: Planet Robobot is the successor to the excellent Triple Deluxe released a few years ago. 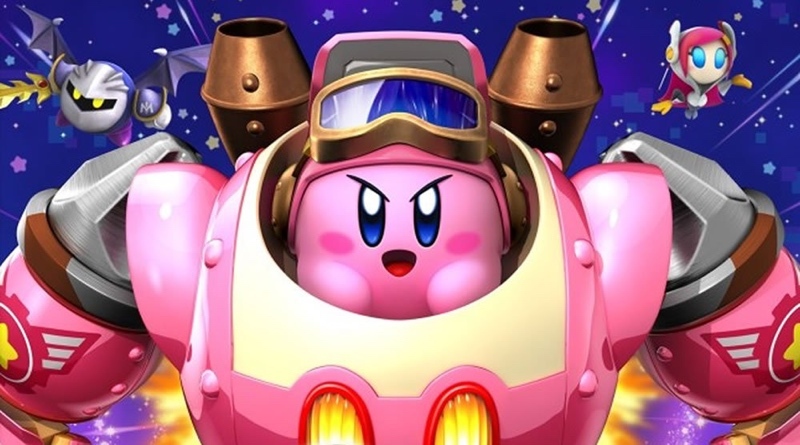 Taking the same graphics engine and spicing up the action with mechs that Kirby can utilize to wreak havoc throughout the varied levels makes for an incredibly fun and fresh experience that should resonate with fans and newcomers to the series. I haven’t been the biggest Kirby supporter over the years. By the time Kirby had graced the NES, I was two years deep into my Super Nintendo library. I had briefly played the NES and Game Boy games, but came away unimpressed with the simplistic and slow level progression. I felt the games were too easy and lacked that special charm found in games like Super Mario Bros. 3, Donkey Kong Country, and Yoshi’s Island. It’s probably no surprise that the multitude of games that followed flew under my radar. Indeed, it wasn’t until Kirby’s Epic Yarn for the Wii that I once again gave the franchise any time of day. Thanks to its unique graphics and original level design, I fell in love with Epic Yarn and although it played almost nothing like a typical Kirby game, it left me open to trying out more games in the series. So, last year I decided to give Triple Deluxe on the 3DS a try. I wasn’t expecting much, but I was pleasantly blown away by the amazing 3D visuals and the fun gameplay mechanics throughout each level. Since I had largely ignored the franchise up to this point, all of the power-ups and abilities were new and fresh to me. It became one of my favorite game experiences last year and when Planet Robobot was announced and shown off I was immediately excited. At first glance, the game looked very similar to Triple Deluxe, especially in the graphics department. While, that is absolutely true, Planet Robobot refines the excellent visuals of Triple Deluxe and creates an even more immersive experience, especially if you turn the 3D effect on. In fact, I’d even go as far as to say that this game makes the best use of stereoscopic 3D I’ve ever seen. There are layers upon layers of animations here. In one level there are vehicles driving on hills in the background, making their way up to the foreground where, if Kirby is hit, will go flying out of the screen, flattened like a pancake as he flops to the ground. In the simplest of ways it reminds me of the classic Teenage Mutant Ninja Turtles: Turtles In Time for the Super Nintendo where enemies could be thrown at the TV screen, splatting in a death animation as they slid off-screen. These types of 3D visuals are everywhere in the game, from simple enemies swinging on a rope in and out of the foreground, to exciting boss encounters that make full use of the 3D landscape. The world of Kirby has never felt so alive and its bright graphics and smooth animations combined with the stereoscopic 3D effect make for a beautiful presentation. The game returns with many of the power-ups seen in the last game. There are several new ones, like the Doctor where Kirby dons a lab coat and concocts new attacks to take out his adversaries. Not since Dr. Mario is it so fun to push pills. Of course the real stars of the show are the various mech suits, called Robobot Armor. These vehicles will vary widely in their powers. Some will have massive saw blades to tear down your enemies in an instant. One of my favorites is the Fire Mode where both of the Robobot’s arms become flamethrowers. Not only can you burn your enemies to a crisp, but also Kirby can dash across the stage, leaving a trail of fire in his wake. Each Robobot has its own series of moves and special abilities, making each new one a joy to experience. The only downside is that the Robobots are only available in specific levels and at set points. In other words, you can’t keep your Robobot with you throughout the entire level, which makes sense, as the game would probably be too easy otherwise. Still, sometimes I felt the Robobot suit was too short-lived and longed to have access to it for longer stretches of the levels. Much like a Mario game, hidden throughout each level are three Code Cubes. These are used to unlock special stages in the worlds, so you’ll want to try and find as many as you can. Some of them can be a little tricky to nab, but for the most part as long as you explore each area you shouldn’t have too much trouble locating them. Of course you can replay any stage as many times as you like if you do miss one. 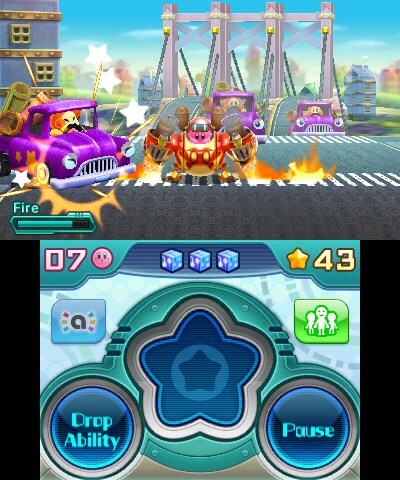 Beyond the main game are two additional modes that can be played. 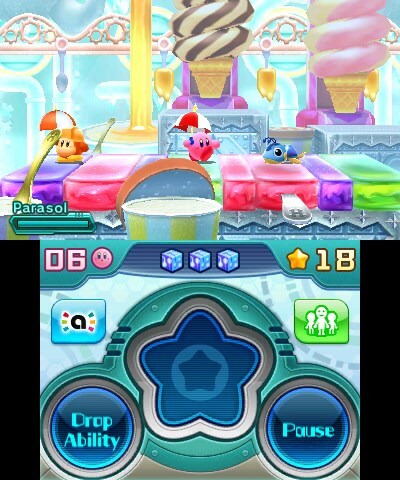 The first is Kirby 3D Rumble, which has a ¾ overhead view perspective of the playfield. Here you are trying to clear the enemies from the levels as quickly and efficiently as possible. You get extra points for taking out multiple enemies at a time. At the end of the world you will earn medals and extra points if you are able to collect all of the coins, take no damage, speed clear, or obtain full combos. This is a fun little mini-game that can become quite addictive for those obsessed over high scores. The other main mode to play is called Team Kirby Clash, which allows you to play with up to three friends for 4-player co-op mayhem. This mini-game has some RPG elements to it. At the start of the quest you will be able to pick your role, such as Sword Hero, Beam Mage, Dr. Healmore, or Hammer Lord. Each character has its own stats, including stamina, attack, and recovery. Basically this game is a boss rush mode, except they usually have a ton of hit points. Each hit you land will show off damage points that you and your team is dealing. As the battle progresses, tablets will appear on the battle stage. If all of your teammates manage to grab one you can execute a meteor attack for a chance at massive damage. After you defeat a boss, you’ll earn experience points and can level up your character’s stats to make him more powerful. I enjoyed this diversion more than 3D Rumble, but both are fairly short experiences that, while fun, won’t keep most gamers occupied for a very long time. With its awesome visuals, fantastic controls, and surprisingly deep gameplay, Kirby: Planet Robobot is a fun platforming game that shouldn’t be missed. It sports some of the best 3D graphics out there and the levels are unique and fun to explore. The music is upbeat and lively and the boss encounters are fresh and exhilarating. Really the only knock against it is that it can be a bit on the easy side, especially for veterans of the series and for those gamers that grew up playing games like Mario. It’s not a total cakewalk, but it may not be challenging enough for some players out there, which can have an impact on replay value. Still, a lot of care went into this game, and it definitely shows! Don’t pass this one up. Kirby fans and newcomers alike will find a lot to enjoy in Kirby: Planet Robobot. Levels are fun to explore and bosses are exciting to battle. The mech adds a new layer to an already fun power-up system. The game may be too easy for some players, but the game is still enjoyable from beginning to end.